I’ve teamed up with the wonderful YouTubers in the Beauty and the Vlog Facebook Group for a fun Halloween Makeup collab. The theme is Pretty Scary. Basically we each took a scary Halloween look and made it glam. 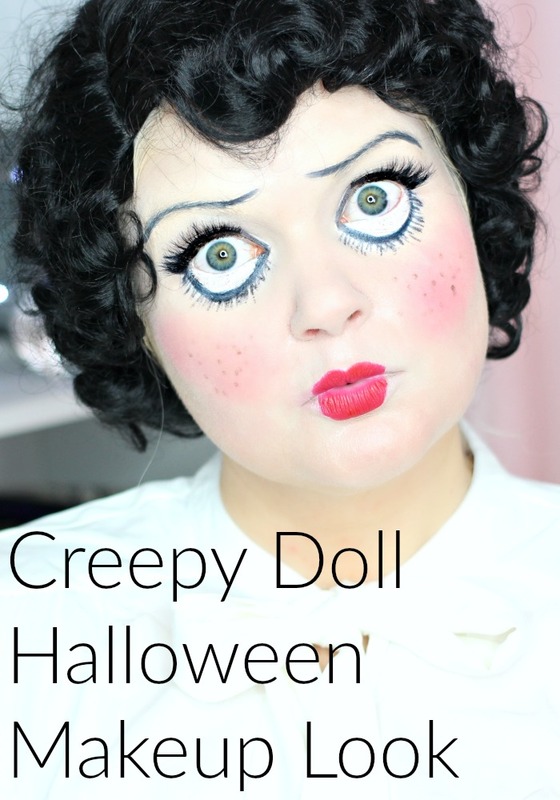 You can see the other videos in this playlist, and you can see my Creepy Doll Halloween Makeup Look w/ Faux Freckles here….. I actually had a hard time coming up with an idea for this collab. I don’t tend to like scary Halloween stuff. I had this wig from a Betty Boop Halloween costume I did years ago and it felt like vintage doll hair. So after some Googling and Pinterest searches I came up with this look. I started with the new CoverFX Custom Blot Drops, which I’ve been loving as a primer. Then I added the CoverFX Custom Enhancer Drops in Celestial for a very pale glow. It’s normally a little light for an all over the face highlight, but I wanted a very pale, porcelain look to my skin. I used the It Cosmetics Bye Bye Undereye to cover up my brows and lips. I had to use a TON for my brows and I probably should have tried a glue or soap to help cover it, but it did a pretty good job on it’s own. I also ended up just using the concealer all over my face for a full coverage pale effect. My Stila liquid liner worked so perfectly for the brows and eye details. Adding blush with a damp beauty blender gave a pink cheek effect that you see on vintage dolls. I also used a Physicians Formula bronze pencil and twisted the tip on my cheeks to get the faux freckles that I have been seeing a lot of YouTubers doing lately. I drew on a cupid’s bow lip and covered it with my Kat Von D Everlasting Liquid Lipstick in Underage Red… I couldn’t help myself because the name is so fitting for the look, but any red will work. I finished the look with the Ardell Mega Volume Lashes* that I got in my GenBeauty swag bag. They are the most dramatic lashes I have and I wanted a really bold false lash because dolls tend to have those thick lashes. Here’s how a achieved the look…. What was your favorite Halloween costume? What are you dressing up as this year?